High school students on an expedition co-funded by this program in 2015 visited Valdez and met with our staff members to learn about the Council and improvements in safe oil transportation since 1989.. 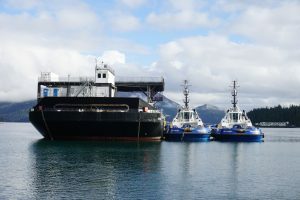 The Council works to educate Exxon Valdez region youth about the environmentally safe operation of the Alyeska terminal and associated tankers. Working with area youth is vital to fight complacency that can arise if new generations of citizens are not continually reminded of the need for ongoing oil spill prevention. To support this effort, the Council is inviting proposals for facilitating learning experiences with Exxon Valdez oil spill region youth. UPDATE: The deadline for submittals has passed. Please contact Outreach Coordinator Lisa Matlock for more information about the next application period. Sam Stark, an Oregon State University researcher leading the teens on their bird adventure, smiled and congratulated her on her keen eye. Stark developed several activities for these lucky middle schoolers, to teach them how scientists work to restore populations of wildlife affected by a major oil spill.